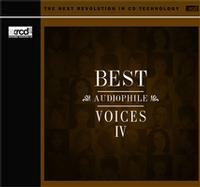 The fourth collection in the Best Audiophile Voices series brings you the impressive vocal talents of Stacey Kent, Jheena Lodwick, Salena Jones, Jean Frye Sidwell and many more well-known female audiophile artists. Also for the first time in this series several male artists are also present on this CD including Tim Tamashiro, Hayati Kafe and Al Somma. Contains 12 tracks including covers of such well known songs as "Wind Beneath My Wings," "A Child Is Born" and "You Don't Bring Me Flowers Anymore." In approaching this rich collection, the performance of the artists will touch your soul as it is designed to be enjoyed and admired with your audio system. Released on the high-resolution audiophile format known as XRCD this CD is playable on all CD players. Listen and compare.